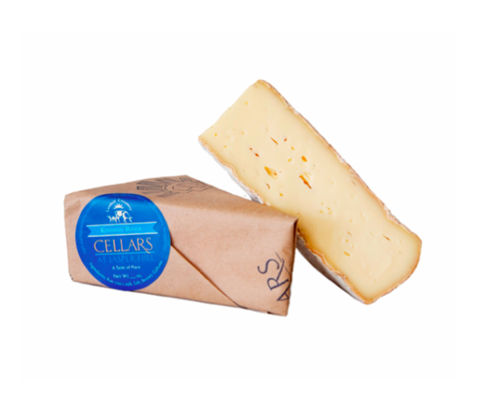 Landaffians may already be familiar with Doug and Deb Erb’s wonderful cheeses: Landaff, their original recipe modeled after Caerphilly cheese from Llandaff, Wales and their softer second type known as Kinsman Ridge. I love them both but Kinsman is a special favorite. Soft, buttery, and aromatic, this is a cheese you spread rather than cut. Doug and Deb spent a couple of years getting this recipe just right, this time using French Tomme cheese as their inspiration. 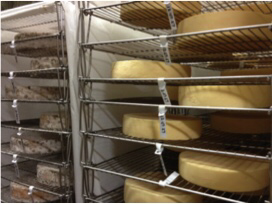 But this Thanksgiving the Erbs and Jasper Hill Farm, where the cheese is aged in limestone caves, got a big surprise and serious national recognition when they took an order for 54 wheels of Kinsman for the high Thanksgiving feast at the White House. I just have one question for Doug and Deb: how are you going to top that?? To get your own Landaff or Kinsman, you can buy it at the creamery or the Littleton Co-op, order it from the Landaff Creamery website (landaffcreamery.com) or the Jasper Hills website (jasperhillfarm.com). Take some with you when you travel and you’ll be welcome anywhere. December 30, 2016 in Landaff Businesses, People, Town and Community. Landaff Creamery top 10 on Epic Cheese Trail NH! Old Home Day a Success! Love this!! Thanks for sharing. You should be so proud. I know we certainly are! Congrats to Landaff Creamery…quite an honor and a testament to the quality of their cheese!! That is so cool!!!!!!! Congratulations!